This is my first entry into the Project Sewn competition. The theme for this particular week was fashion icon. I mulled over this one for a whole month, not knowing what to do and finally, when I did start sewing, things took their own turn. A turn, I'm happy to say, ended up working. I chose Katharine Hepburn as my icon and before you say, "You're outfit doesn't look anything like Katharine Hepburn," let me explain. I chose Katharine because of her tendency to sport menswear and its one that I've found myself favoring a lot in the past year or so (ever since the pixie cut). I look good in masculine type cuts, yet with lots of splashes of femininity. This ensemble? Case in point. The opportunity to create a small mini wardrobe from this competition has been soooooooooooo fun. One of those "aha" moments where you finally get the point of what it means to create a wardrobe - that's what its been like for me. This first entry incorporates so many details that are well, so much apart of my daily uniform. 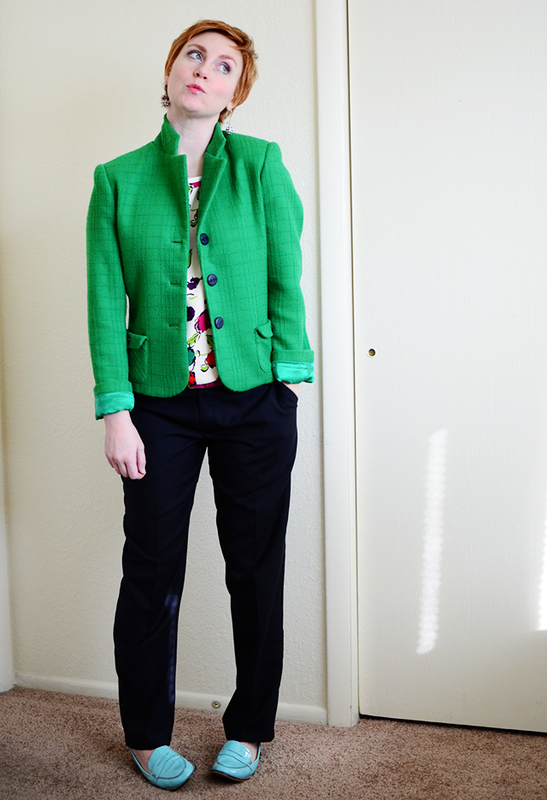 Pants/trousers (a must for a gal on the go like me), one hell of a jacket and a lovely little top. I'm finding more and more that jackets are my thing. Good gravy, I love a good jacket! I created a rub-off pattern from my favorite jacket of all time for this one! For the most part, since this was the first time making up the pattern, I opted to go with the details of the original jacket. Except the pocket - had to do something a little bit different there and I added bound buttonholes. The interesting thing about this jacket is that the body is comprised of 3 main pieces - jacket front, side and back whereas usually most jackets are comprised of more pieces. The fit is perfect for me, the whole reason I rubbed off a pattern from the original. PERFECT! 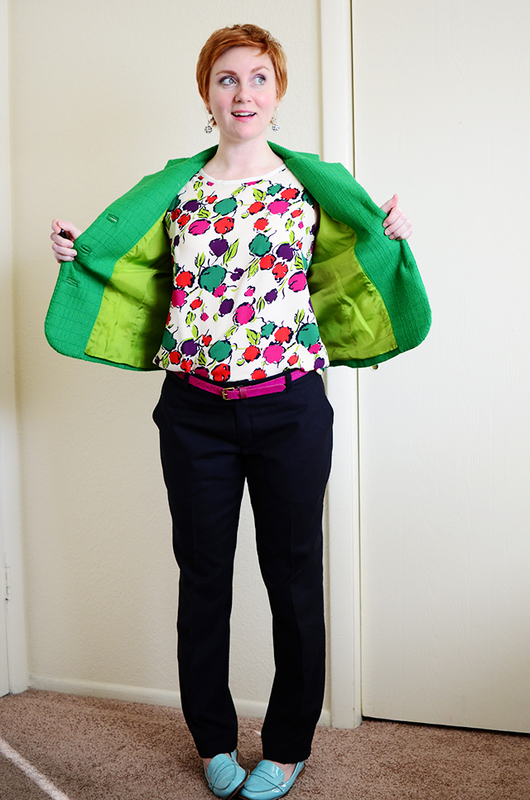 The jacket was fusibly tailored and took a good chunk of my time frame, but I'm so happy with it I could shout for joy, which is exactly what I did! 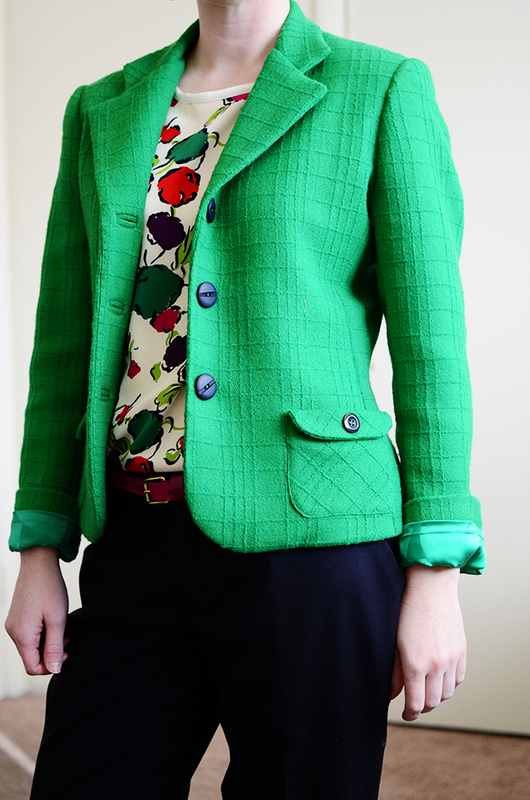 I also have to add that this green texturized wool - it loved being tailored. Seriously, loved it. Ate it up. 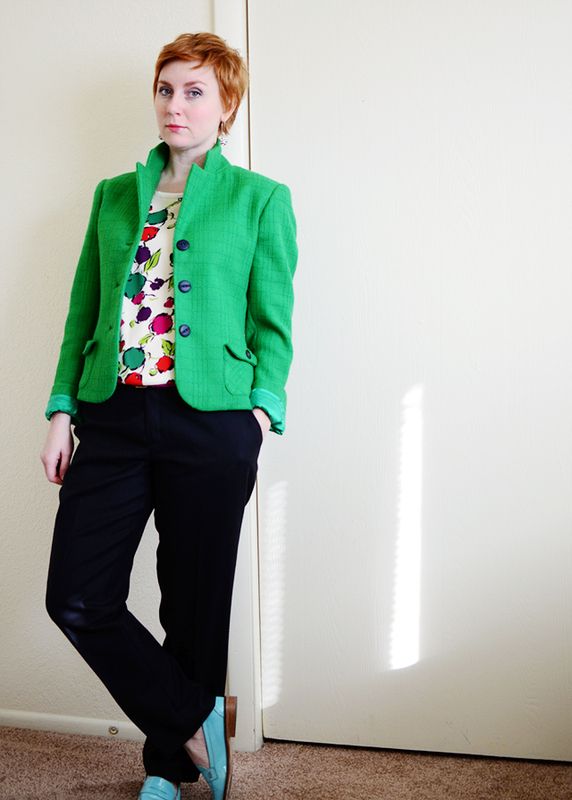 The pants are my Burda 7447 (sadly out of print now, AAACCKKK!). A TNT (tried and true pattern). I made a few more tweaks from the last time I made it - admittedly, it takes a few times to get all the kinks out of a pattern. Love these though. Made from a plain weave navy wool suiting from my shop. This wool has some pretty lovely drape and they look so nice as pants. So nice. I realized something about pants and me and this is good because I've needed to realize this for some time now. Originally, I was planning to knock off Katharine Hepburn's wide legged men's trousers. I created a pattern from my TNT and I'm finally coming to the realization that I really really don't like the way wide legged trousers look on me (or it could be that I just haven't found a pattern that I feel flatters me). I don't look long and lean and swanky. I look doudy and frumpy and blah. I have stumpy legs. I've always known this. And tapered (yes, I just typed tapered!) trousers look good on me. Oh. my. goodness. Did I just admit that my mom's 80's trousers look good on me? Why yes. Yes I did. Fully lined in bemberg rayon, these lovelies are pretty much pj's to wear. Sigh. My top is just a simple shell made from Newlook 6483 and tops are well, a new thing that I really need to get in the habit of making more of. I don't have enough tops and I don't make enough tops. And there is a huge, deep and dark void in my closet and if I'm honest, a good portion of my wardrobe doesn't get worn because I have no tops to go with the things I make. The interesting part about this top is that it was the hardest part of this particular outfit. I don't know about you, but bias bound edges are not my friend. Oh my gosh! I hate bias binding so much (at least when done in silk charmeuse)! However, the top really does complete this outfit giving it instant fun and color. Pulls the whole thing together in a pretty brilliant way. I used a silk crepe from Mood and underlined the blouse and bias bound the neckline and armholes in silk charmeuse from my shop. Don't know if you noticed, but in the past year I didn't share a lot of makes. I was doing a lot of soul searching and finding a style that captures my personality. Sure it's not original, but this look gives you a much more.... authentic representation of myself than I've ever really given here before. Knowing what looks good on me, what feels good on me and how I like to express my personality through my dress has been a real eye opening experience in the past year. And that, in and of itself, really feels good. I've loved where this journey is taking me. Now, hop on over to Project Sewn and vote for your favorite creation - and I do mean favorite, because you know, my creation may not be your favorite and that's A. OK. I'm just loving the challenge to create a fresh wardrobe of things that I'll actually wear, on a daily basis. However, this is not to say that I wouldn't love your vote, because I really, really would. Enjoy friends. Now off to put the finishing touches on something pink! I adore this colour and pattern combo. Definitely won my vote for round one! You look amazing! The green of that jacket is just so delicious, and I love the whole look. Best of luck! You look great! This blazer is just wow! That jacket is so perfect for you! The fit is really flattering, yet it looks comfortable. And I love the color! Good luck! This is perfection Sunni. It really is SO flattering and chic. Isn't personal style idiosyncratic? Your outfit would look TERRIBLE on me (tapered is not my friend) but its so flattering and exactly "You". that green on you is THE BOMB. just delicious!!! Gorgeous!! I love everything about this entire outfit. You make such beautiful clothes! Great job channeling Katharine Hepburn. She is one of my style icons as well. Your take is so modern, so YOU! Oh, how I adore this ensemble! You've done a stunning job and I love hearing about your journey of your style discovery. Can't wait to check out that 'something pink'! Love the ensemble, and I'm totally with you on not sewing enough tops! This looks amazing! You girls are really bringing the heat! I'm so excited for the rest of the challenges- can't wait to see what else you come up with! Seriously, awesome job! This is really beautiful, it's playful and fun and captures your personality so well! I love it. It's wonderful that you've been thinking about the styles that suit you best. I love the mix of colourful fabrics in conservative styles. Very nice! Your outfit pops! It all comes together nicely and I agree the blouse pulls it all together a fun but polished way. 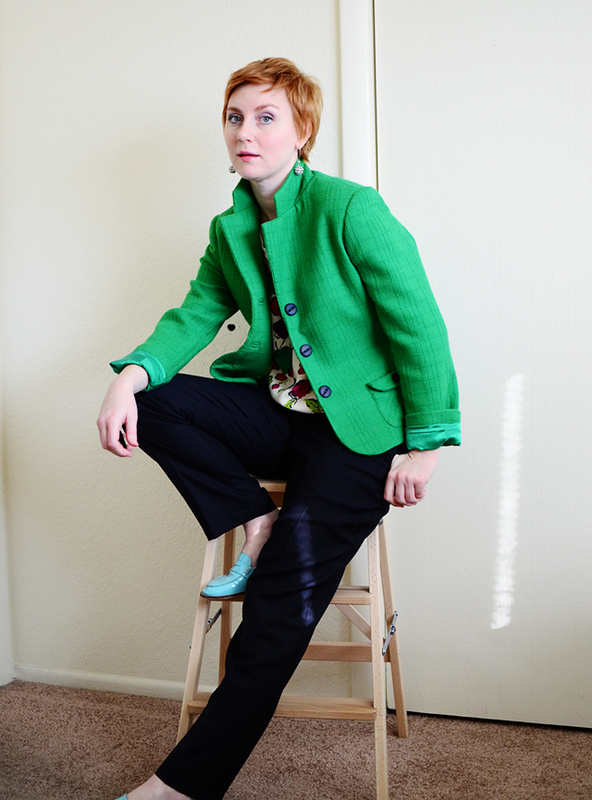 You are like the Blazer Queen. This one is gorgeous. I totally relate to your thoughts about personal style...I, like you and so many others, have fallen prey to making things for myself which aren't my style or which I never wear. 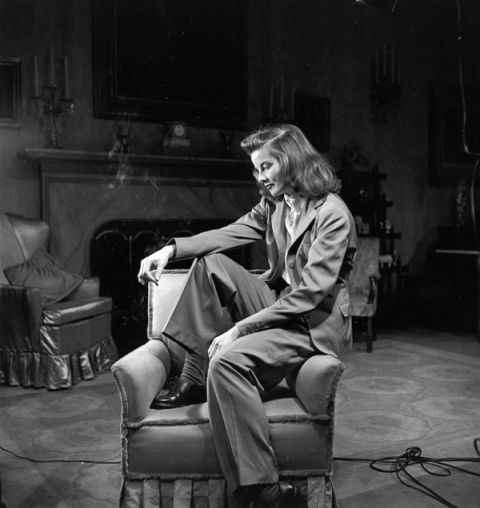 If it makes you feel any better, I think there aren't many people besides Katharine Hepburn herself who would look as great as she does in those giant flared trousers. Sunni, you are a queen. What better woman to represent than Katharine Hepburn. She was not only gorgeous, but strong. Not strong physically, but a strong woman! Wow! So much hard work and it shows! It all adds up to an amazing outfit that looks distinctively YOU. And that jacket. DON'T. EVEN. GET. ME. STARTED. It's bananas! You look so great, Sunni. Love that you're finding your style and that we get to see some new makes from you. I always love your color mixing. I love that you chose Katharine Hepburn! Your coat is amazing, I want one exactly like it. You really knocked it out of the park! I love the blazer! You wrote that the jacket has three pieces: front, side front, and back. I would love to see the back in more detail (and the side front - I'm assuming it's an armhole princess seam). Did the original jacket have the same closure at the back or was that your own idea? Wow. Sunni, that jacket is absolutely stunning and the whole outfit evokes a modern Katharine Hepburn vibe. You look smashing! Good luck in Project Sewn! Lady you are flawless! Just amazing work and such beautiful styling. I love everything about this look. Well done! Wonderful fabric and lining color choices. It is nice when you know your own style, even nicer when you can express it creatively. Oh doll I see what you mean about finding a representation of your style. This just sings you :) That jacket is so beautiful and the colour just pops. Massive well done. Love the mix of colours and texture here. The pockets and back detailing on the jacket give it an extra edge. Just to say, I didn't vote for you but it was such a close thing and I am second guessing myself right now. Love it love it love it love it. So well done, you must be feeling so proud. i love the outfit you've pulled together here. these wearable pieces are far from boring, but still practical. the green color looks divine on you... such a great color palate! Very cool and very wearable! Very well done! I love your jacket!! But are you saying.. you created it without a pattern??? when you say it is a "rub off" ?? That blows my mind! Came over from Project sewn! Hope you make the cut! I love love love your jacket. Best outfit ever. I think we have twin styles. (Well you are wearing my dream style). Just started sewing again (first time since high school). This would be my ultimate outfit to make once I get the hang of things again. This is a great outfit! That colorful shell top is PERFECT :) I am so tempted to go buy that fabric right now! Completes the outfit perfectly! 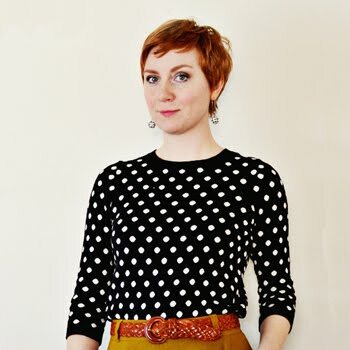 I love wide leg trousers too - but not on myself! They stumpify my long legs like nothing else. One of my recent sartorial realizations. So sad.